As a lifelong musician (singer, pianist, violist and violinist) and now birder, I had been eager to travel to New Zealand, the Land of Birds and their music. But once there, I discovered that the land’s heritage of millions of years of birdsong—the voice of the forest god Tane, in Māori culture—had been silenced. I began to wonder what it was like for the birds to lose their entire musical culture. In studying how this rupture might be healed, I found that recovering these birds’ ancestral wild music might involve some agonizing moral choices that reflect parallel challenges around the world. into the world of light that created a world of music. We held God in our throats as long as we could that autumn evening. Our high-school choir’s Deo! stretched out on the suspended chord until our director’s baton sent us up to the glorious climactic resolution of Bruckner’s Locus Iste. Then with a turn of his wrist, he closed the phrase in a grand pause. The audience packed into the Washington National Cathedral sat still and hushed as the ethereal tone rang through the silence, taking six full seconds to dissipate through the 300-foot nave. I was transported, swept along with the reverberating waves as they stretched out through the church. I’d never felt so immersed in the sacred. Now, forty years later in a dusty mountain hut nine thousand miles away in New Zealand’s Southern Alps, I found myself imagining Washington National Cathedral under attack by an insidious invader, my choir straining to keep singing through ominous rumbles, while the very stones split into shards. Murder in the cathedral, while I listened. Sir Paul Callaghan gave a passionate speech a month before his 2012 death. Barely able to stand, the eminent New Zealand scientist called for the preservation of his nation’s unique heritage and gift to the world, akin to Stonehenge or Lascaux or the Great Wall: its birds. Why are New Zealand’s birds so special? The answer echoes down through time from sixty million years ago, when New Zealand split off from Gondwanaland and gathered a protective sea about itself. The new islands’ birds found themselves in a glorious castle with an immense moat. Without mammalian predators scurrying and climbing, the birds flourished, filling the forest floor and low shrubs with their nests. The waters, forests, and mountains of these stunning islands became home to two hundred forty-five breeding bird species, almost three-quarters of which were found nowhere else in the world. As the Māori became familiar with their new island home, they were surely in awe of its dawn bird chorus, which they called te waha o Tāne, e ko i te ata: voice of Tāne, the god of forests and birds. Some gods’ names should not be spoken. But I was able to find a recording for this most important son of the supreme being: “TA-nee,” said the deep voice. Something about it made me shiver. The Māori saw bellbirds as nga aitanga kapakapa a Tāne, winged children of the forest god, perhaps because of their magical song. Some believed korimako’s father was Rehua, the forest god who was the main servant of the supreme being. The bird’s cultural association with spirit was so strong that it played a central role in Māori baptism: a living korimako was touched to the baby’s head and then released to fly freely out into the world. Animals or humans, every choir has its dominant singers. 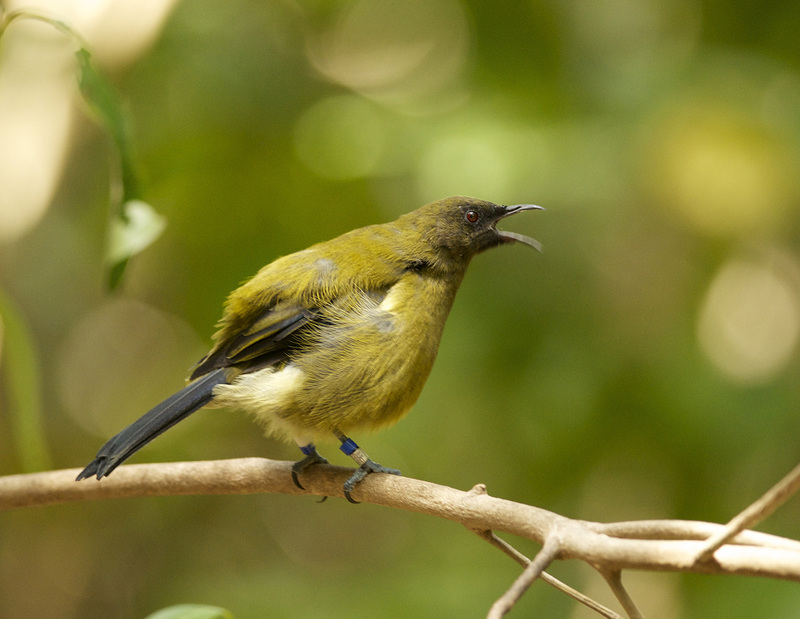 Although the bellbird’s song was the most lyrical, the most piercing voice in this soundscape was provided by saddlebacks (tieke). Dark-toned with beautiful russet feathers across their backs, they bear a charming set of orange wattles around their beaks. To the Māori, saddlebacks were birds of omen. Paddling the land’s lively rivers, Māori canoeists chanted for guidance from tieke, “birds of knowledge…wise birds that bid us watch the omens of the sky.” The Māori avoided killing these foretellers of the future—but the voice of Tāne would be hushed by other threats. Now finally in New Zealand, I wanted to hear for myself this “melodious wild musick” in the place that composed it. Eager to explore the Southern Alps, Rob and I were finally beginning our hike on the Routeburn Track, one of New Zealand’s famous Great Walks. In the quiet as we walked, it was easy to appreciate the purring of the Route Burn (“burn” means river) beside the trail, sliding between mossy rocks. Over its burbling music, I could hear scattered calls of Riflemen, called titipounamu in onomatopoeic Māori. These little birds, black and tan with yellow highlights, dart about in the shadows, making tiny little peeps higher than many people’s hearing range. Occasionally we caught the lower-pitched counterpoint tones of South Island Tomtits (miromiro). These few small voices accented the forest’s enveloping quiet. Over the next two days, we trekked through shifting soundscapes. Above treeline, winding our way through sparse scrub, we could hear the distant rush of waterfalls across the deep valley, with glaciers of the rugged Harris Range sparkling on the horizon. We descended through magical hobbitish woods where gnarled beech trees were occasionally sprinkled with the now-familiar voices of titipounamu and miromiro. We reveled in the absence of civilization’s noise; the relative silence, broken by a few companionable bird species, felt serene and meditative. But where were the land’s famous birds? Suddenly I pictured sitting on our deck back home, enjoying the chickadees’ chatter, when the sound abruptly ceased: our neighborhood Cooper’s Hawk had arrived. Here on the trail, Rob and I realized to our shock that these peaceful-seeming woods were too hushed. “There are all kinds of silences, and each of them means a different thing,” wrote Beryl Markham. As so often happens, an apparent peace was deceptive; the sinister meaning of this particular silence began to dawn. My parents were nonreligious, so my own baptism—the bestowing of an identity as part of a community—was not by the grace of wings in the Māori tradition, nor through washing by the holy water of Christianity, but with notes poured from the sacred vessel of music. My father noodled with Bach and Beethoven on the old piano in my childhood home, singing and whistling around the house, so I always knew that music would be part of my life. I played viola in school orchestras, then finally discovered the ecstasy of using my own body as the instrument in choral music. And it was that one particular performance of Bruckner, in the magnificent Washington National Cathedral, that first opened for me that path to transcendence. Bruckner composed Locus Iste a Deo Factus Est—“This place is made by God”—specifically for Austria’s Linz Chapel, where his exquisite chords would fade languorously. The motet would be beautiful in a tiny urban condo too, but its true character and power can only be realized when it’s sung in the kind of place the composer intended: cathedrals like forests, with their thick grooved columns and intricate arched ceilings. Likewise, the forest cathedrals of New Zealand shaped the wild music that filled them. The contours of birds’ voices as well as their bodies reflect their ancestral home’s instructions over millions of years. Soprano voices tend to be dissipated by small leaves, but near the forest floor, it’s easier for the lower tenor and bass bird voices to power through the scattering surfaces, so they can be more successful in talking in the trees—and thus more likely to perpetuate their genes through their offspring. Species who hang out higher in the forest, where there’s less vegetation to scatter their voices, tend to have slightly higher-pitched voices. Birds whose habitat is grasslands tend to have the highest tones, since once you get above grass level, there aren’t many leaf surfaces to disperse their messages. A woodland bird’s communication is also affected by the other characteristic sounds of her landscape. Rushing water, falling rain, wind rustling the leaves can all obscure her call. And the dawn chorus includes a diverse choir, whose mixed voices may make it hard for a distant forest bird to hear his beloved’s voice. Together in a complex habitat, the singers’ voices grow choral, blended in a harmony unique to each place. But now along the Routeburn Track, the glorious green cathedral stood desolate, its choirstand empty, the air in its long nave still and silent. What could have happened? At dusk on our final night of the hike, the track descended through beeches that opened onto a small blue lake. The Mackenzie Hut beckoned from across the water, its green-gray walls blending with the evening woods. After we plopped our backpacks onto adjacent bunks in the dusty dorm, we made our way back to the cooking and sitting area, legs quaking from the long downhill stretch. On the bulletin board among trail brochures and kitchen instructions was tacked a handwritten note on lined paper: Warden Talk Tonight. I really wanted to just collapse on my bunk with a hot meal. But I was perplexed by the forest’s inauspicious quiet; perhaps the ranger could shed some light on the mystery. Conservation Ranger Evan Smith, bright blue eyes sparkling behind wire-rimmed glasses, explained what had transformed the Land of Birds into this hushed habitat as I scribbled notes into my well-worn trip journal. As with so many gods, the bellbird’s worshippers carried the seeds of his destruction. “When the Māori prepared for their long exploration of eastern Pacific islands, they loaded up their canoes with the food rations that would sustain them,” said Smith. That included Pacific rats, kiore, who resided in the floating pantries. The kiorekere disembarked with the paddlers on Aotearoa, finding there a bounty beyond measure. Easily accessible on the ground or in readily climbable shrubs were plentiful birds’ nests. Traditional Māori stories claim kiore as harmless vegetarians who were often revered, though it’s now clear that they also eat eggs. Creating a human community in a new land, the Māori cleared the forests for their new homes and gardens of taro and yam. Removing trees also made for easier hunting of the massive, flightless moa and its rich meat. Half of the islands’ lowland forest habitats were gone in a few generations. Smith paused to sip the precious beer a grateful hiker had offered. Then he continued: “When Europeans arrived in the late eighteenth century, along with two more rat species, they saw the remaining forests as excellent sources of timber for shipbuilding. The Māori had already sent at least thirty bird species into extinction. Once Europeans colonized the islands, another sixteen bird species disappeared forever.” The little songbirds didn’t have a chance. Introduced predators, Smith noted, still kill twenty-five million New Zealand birds every year. Māori hunting extinguished the voice of the choir’s basso profundo—the moa—and their kiore eliminated some of the forest’s higher voices. European settlers continued the depletion until just a few soloists were left. The birds were victims of hunting, habitat destruction, multiple predator species, dogs, and hungry humans. And with them went the wild song of the forest, replaced by just a few voices crying in a now-silent wilderness, distant echoes fading with time. We all sat in momentary quiet as we digested Smith’s story. Inside this stunning scenery, below the silver beeches, a stealthy army was systematically devastating the sylvan songscape. Because of people like us. Why should it matter to us, humans or birds, if a place goes silent? As birds’ music is shaped by the particular place in which it arose, our human brains are places shaped for, and by, music. Just out of the womb, the youngest infant responds to music; our brains are wired to be responsive to song. It’s not surprising that music ranks first among hobbies. Singing and other forms of music actually change the parts of our brains that are connected with emotion—which is why we do music. Music stimulates the hippocampus that joins the two halves of our brains, and we experience more joy, a greater sense of peacefulness, softer hearts. More hippocampus activity helps us love our babies more; imagine the ineffable tenderness between the child and the parent singing her a lullaby. And science has shown that this is true for other animals as well as humans. Music shapes our human brains, connects us to each other, heals us both emotionally and physically, embraces us in culture, deepens our everyday lives with transcendence. Was the same true of New Zealand’s birds, I wondered? I began researching what music might mean to birds. Sarah Earp and Donna Maney of Emory University knew that birds’ brains include areas analogous to the music-triggered areas in people, and wondered whether this might mean that birds respond similarly to music. They studied how birds’ brains responded to their own species’ songs, and the result was clear: females have a positive emotional response to hearing males’ songs. Males dislike hearing those same songs, presumably since they represent a potential competitor. Earp and Maney concluded that yes: birdsong probably elicits in birds emotional responses like ours. Sometimes that’s a useful thing for birds, when they use a date’s singing to decide whether he’s likely to be a good mate, or sing to stake out a territory. I met my partner Rob on the choir stand. At our first rehearsal, as we began the opening so-mi-do of our first piece, Croce’s O Sacrum Convivium, we found our voices blended well together. Leaning in, we tightened the harmony. If I’d encountered an equally fine tenor voice singing another kind of music—say, heavy metal—the story may well have taken a different path. Music is the food of love for birds as for us; a bad playlist can be a real turnoff. Since saddlebacks tend to spend their lives in the same general area without migrating, getting along with the neighbors is important to everyone’s wellbeing. Singing similar songs year-round helps them do this; everyone is friendlier. Touchingly, if a female saddleback is widowed, she’s more likely to accept a new mate who reminds her of her deceased husband by singing the same songs. But sometimes music isn’t about utility. I’ve been known to sing in the shower, without an audience, simply because it feels good. Neurological evidence confirms that birds too just plain enjoy both listening to and performing song that’s not purposeful. New Zealand songbirds are baptized into their sacred community through music—as I was. Many birds learn music from their fathers, as I did. Bellbirds and saddlebacks didn’t just sing: they belonged to a musical culture. As I learned about music’s importance to birds, my heart broke for their land’s silence. I tried to imagine what the bellbirds and saddlebacks might have experienced as their forest cathedral was being destroyed: their Locus iste a Tāne factus est, their sacred home. That’s when I started picturing the National Cathedral being destroyed stone by stone, arch by arch. The machines of destruction would make it hard to hear my fellow singers, or even the music in my head as I anticipated each note. As the nave and transepts collapsed, the sound would be muffled, lacking reflections from the hallowed walls. When chunks started falling from the ceiling, my fellow singers and I would run from the threatened choir stand, and Bruckner’s lovely tones would gradually disappear, forever estranged from the place for which they were created. My father’s tenor is still pure and fine at ninety-two, and he still sings and whistles around the house as always, so I hope to have many more years of singing. At some point, though, my vocal cords will stiffen and my larynx lose its tone so that I’ll no longer taste in my throat the sweet communion wine of God incarnated in song. When age finally takes my voice, I can still experience music. I can play other instruments and listen to recordings of Beethoven and Bruckner. But when the bellbirds and saddlebacks lost their fellow singers, their entire musical culture was threatened with collapse. They had no CDs, no online streaming of their favorite songs. They only had each other’s bodies, and memory’s seeds of song. Ranger Smith’s story didn’t end with the death of Southern Alps music. Haunted by the lack of birdsong along his beloved Routeburn Track—and tired of the unceasing complaints of hikers who, like me, had wondered where all the birds were—Smith had asked the Department of Conservation whether he might set up some traps along the trail for stoats and rats. They agreed and started him with six wooden boxes. Smith also began telling the songbirds’ stories to hikers, who asked how they could help. Obtaining DoC permission to take donations, he has now protected almost twenty square miles from predators. Smith’s work, with the generosity of hikers and other donors, is bringing the Southern Alps alive again with the sound of music. And an ambitious new initiative calls for elimination of predators not just in small sections, but throughout New Zealand. 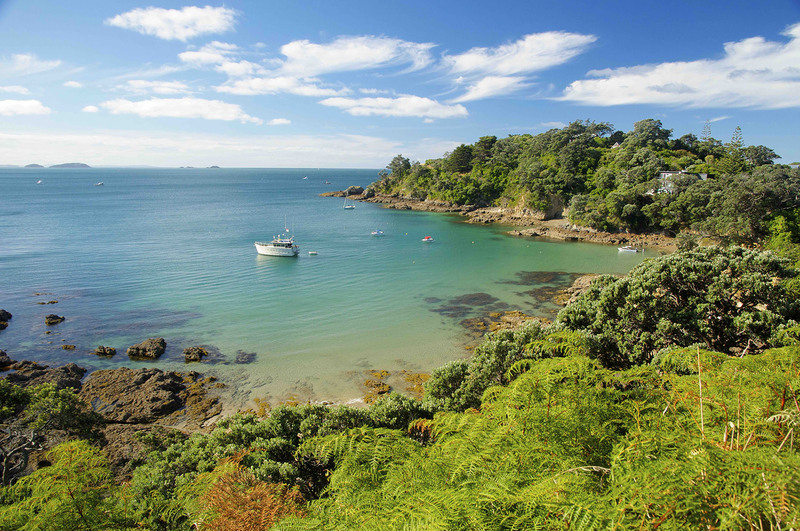 Not everyone agrees that restoring birdsong to New Zealand’s main islands is worth the price. I talked recently with Marc Bekoff, professor of ecology at the University of Colorado. Bekoff notes with horror that New Zealand children are being officially encouraged to kill and celebrate the deaths of small mammals in their yards. He pointed me to a conservation foundation’s photo of a small child gleefully pointing a fist at a mouse crushed by a trap; my stomach turned. Must we really choose between birds and kids’ love of nature? Bekoff argues vehemently that it is immoral to promote widespread extermination of innocent individual animals in favor of others whom we happen to like more. “The last temptation is the greatest treason: To do the right deed for the wrong reason,” writes T.S. Eliot in Murder in the Cathedral. But could preserving New Zealand birdsong mean doing instead a wrong deed for a right reason? Does ending the ongoing murder of music in this verdant cathedral require murder for music in its place? I asked Bekoff how he reconciles his repulsion at killing small mammals with the sense that humans should try to help the bird species whose very existence we have profoundly threatened. The Māori Party’s official platform endorses development of natural alternatives to poison, and science may provide such a path through this ethical conundrum. For example, Megan Serr of North Carolina State University studies genetically modified rodents whose mating produces only male offspring. If these rodents spread their genes throughout New Zealand, their population would drop over time—without killing individual animals. The concept, she notes, still has many challenges to overcome; its success “depends heavily on the genetically modified male mice being ‘studs’ with the island lady mice,” who would need to choose these males over other partners. The future of song in New Zealand, if it is to avoid mass mammal killings, may rely on mouse sexiness. Tūhoe elders recognize the role of introduced predators in damaging bird populations, along with shifts in food abundance that are forced by climate change. But mātauranga, traditional Māori knowledge, looks toward ultimate causes of the decrease that are spiritual rather than scientific. Some Māori believe that the birds’ decline is due to Tāne’s recognition that these huge and dazzling New Zealand forest pigeons weren’t being harvested for food, so apparently they were no longer needed by his children. Others say it’s because respect for the bird is not being demonstrated through traditional rituals and other customs, because of Pākehā’s claims of authority over Māori ways. I still hadn’t heard the true wild musick for myself, so Rob and I arranged to spend a day on Tiritiri Matangi, a predator-free island and restored bird sanctuary near Auckland. I hoped for at least a taste of te waha o Tāne in the very cathedral that had shaped its music. We caught a morning bus to the ferry on a cloudless day, eager to explore this low island whose Māori name means “blown in the wind.” As we stood in line at the terminal, a large sign warned us to check our bags for “insects, mice, rats, and skinks.” Having confirmed that no lizards or rodents lurked in my camera bags, I stepped off Pier 4 and onto the little blue and white boat. Shortly we were trekking along a sandy shore bordering turquoise water. Tiritiri, once deforested, is now covered by a quarter-million native trees planted by volunteers over the past three decades. The gnarled shapes of the thick shrubbery, like muscled arms of annoyed dryads, deterred us from venturing into the seemingly impenetrable vegetation. As the trail found a narrow way deeper into the forest, the towering tree-ferns and waxy-leaved matipo trees gave the place a Devonian feel. Flowering kaiwhiria (jasmine) perfumed the air, luring us farther into the woodland. Approaching the backbone of the island, our ears began to tune to the island’s avian choir. The dignified “parson bird,” or tui, called “Uh-oh!”; strident high whistles let us know that North Island robins were ready for the day. Hearing splashing in the nearby creek, I turned in time to catch a darting movement into the trees. For a quick moment, a freshly washed saddleback gazed straight at me, dark feathers wet, orange wattles glowing like a ginger handlebar mustache. Then he disappeared into the shrubbery to preen in privacy. I stopped in my tracks. I’d never heard tones like this, sweetening the dense forest like mellifluous aural kaiwhiria. At last: the voice of the lyric soprano of the shrubs, the divine diva of the vines. Here was korimako, the bellbird, avian Tinkerbell whose twinkling chimes announce magic afoot—or a-wing. Her voice rang like a glass harmonica: enchanting ethereal tones that seemed to shimmer the air itself. Bee-de-dee! Cheeuw! This hidden bird spoke with a huge vocabulary. Hearing her complicated song, I smiled, knowing that unlike most other songbirds, female bellbirds sing with as much richness and complexity as the males. A flash of olive-green and she was gone; shortly I heard her call from deeper in the woodland. The thick tangle of trees, shrubs, and vines protected most of the singers from our sight, but we got to know them the way they wanted to be known: as the voice of Tāne. Around the world, we’re altering birds’ soundscapes. 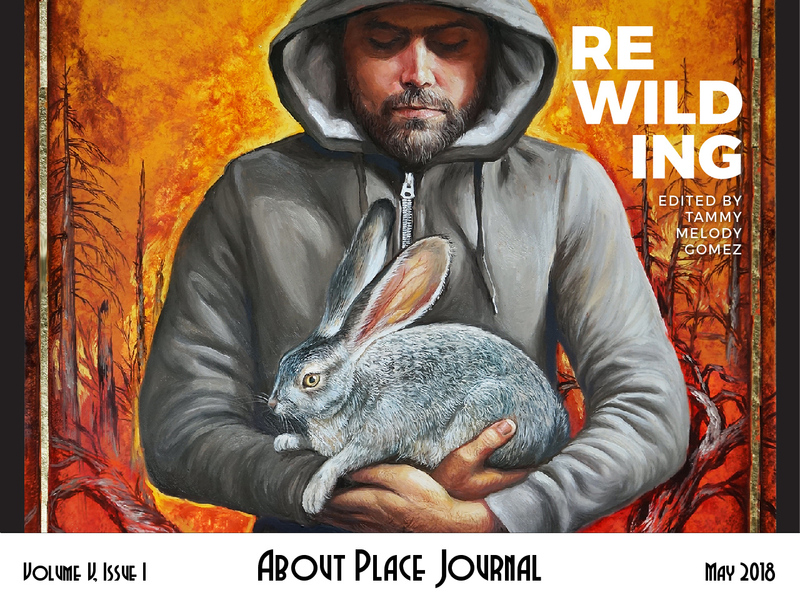 In addition to introducing rats who decimate songbird populations, we expand our noisy cities, convert forests to grazing land or wood pulp or suburbs, send habitat-baking carbon dioxide into the air, altering the ancient music that’s served our avian neighbors since dinosaurs learned to sing. Song may be what transformed dinosaurs into birds, by enhancing their social lives and complicating their brains. So when we cost birds their music, we take away the core of what it means to be birds. Trileigh Tucker’s roots are in Virginia and North Carolina, where she spent the early part of her life, earning her PhD in Geology from UNC-Chapel Hill. She now lives in a little valley in West Seattle, Washington, near the Salish Sea shore, from which she ventures out for hiking, camping, and kayaking. She tends to walk very slowly, though, so as not to miss out on bird encounters. After more than twenty-five years teaching environmental studies at Seattle University—including natural history, environmental justice, geology, and ecopsychology—she is now devoting herself full time to writing, editing, and nature photography. She is currently working on a book about birds and environmental change.